A tandem kayak that only weighs 31 pounds? That's insane! Our Scamper II Inflatable Tandem Sit-Inside Kayak weighs less than an average Western horse saddle. And will get you across the lake a lot quicker we might add. Where can you take this kayak? Well...like anywhere! Without the need for a roof rack, a truck or a membership to a gym. In fact, if you can get you to navigable water, you can get this kayak there as well. But enough about weight. How does it perform? When properly inflated it is stable yet maneuverable. Straight tracking in flat water yet cuts easily through small surf. Performance comparable to those hard-to-store, hard-to-transport and (not to mention) relatively heavy rigid shell kayaks. Also a better option if you live in an apartment and don't want a 12-foot-long orange plastic monstrosity (her word not mine) sitting in your hallway. It doesn't get much easier than this. Unfold it, inflate it, attach the seat, start paddling. It deflates and folds back up for storage just as easily. We've even included a foot pump. 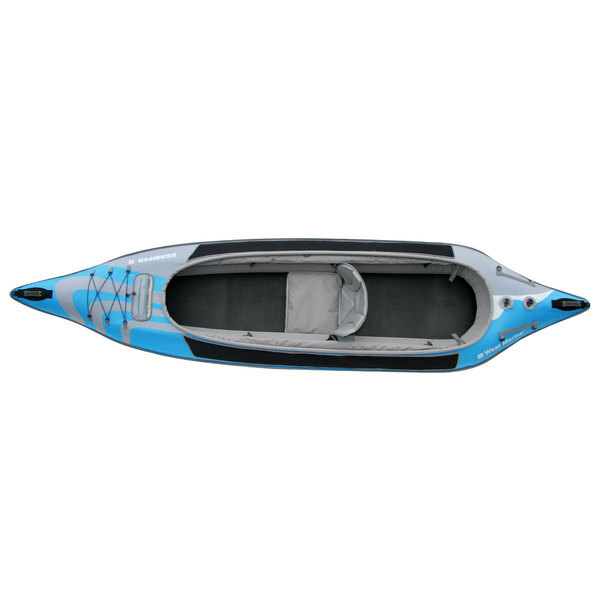 Made from three-layer, heavy-duty PVC tarpaulin with RF (radio frequency) welded seams that provide a consistent air tight seal, our kayak features rigid bow and stern forms and a tracking fin to improve performance and help keep you on course. We've placed a high denier polyester laminate topside over a bottom that combines two sheets of PVC with a fabric mesh, plus a landing plate for increased durability. Abrasion pads are added in high use areas for years of trouble-free paddling. The seating compartment is encircled by air chambers for increased stability. The Scamper II accommodates one or two paddlers with two supportive, high-back, adjustable padded seats that can be set up (as shown in the above pictures) with one seat centered in the cockpit for better weight distribution and the other seat removed or both positioned for tandem use. The foam floor provides insulation between you and the cold water below for extra comfort. The forward deck lacing and mesh accessory pocket are great places to stash items you need access to quickly. You'll also find comfortable carrying handles at the bow and stern to help tote it down to the water or to make those unplanned portages easier. If you don't already own them or it's time to replace the ones you have, remember to order kayak paddles and life jackets (both sold separately) so you'll be ready to splash your kayak as soon as possible!